Mid-November of last year, I tried a beta of the Windows Version of Scrivener. At the time I found it a little clunky. For instance, I couldn’t get the compile or export to work in a satisfactory manner. I’ve now been using the program for over a year, and I have to admit, I’m addicted. I’ve even started suggesting people use scrivener for all kinds of tasks that involve writing and organization. Below, I have taken a screenshot of how I do re-writes in Scrivener. In the main window is my working copy, and on the right is the previous version of the chapter, saved in a snapshot. I used to do this with Word, keeping two windows open at once, constantly fighting to keep the text the right size so I could work and read, as well as trying to keep all the controls on the screen, having to bounce back and forth between windows to scroll. It’s nice to have everything in once place. Well, okay, it wasn’t really that bad, but this is nicer. The other thing I could praise all day about scrivener is the organization. I used to keep my WIP in separate Word files. This was not too bad a way to go, it help with revision control, but it also prevented me from doing things like global search and replace. Also, I find being able to name the scenes a great way to locate information. Today, I wanted to re-read some text from an earlier scene, and I was able to use the scene titles to come within 1000 words of the description with almost no effort. That’s not to say I haven’t had problems. There’s an odd bug that always ends an em dash followed by a quote with one open quote rather than a closed quote. Even on my brand-new MacBook Pro, I sometimes have trouble with the real-time spell check falling behind. I wish each project could have it’s own custom dictionary. And even after using it for a year, I feel like a novice. The more I use Scrivener, the more I find myself relying on it and recommending it to others. If you want to try it, there’s a 30-day free trial. 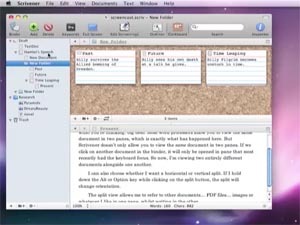 This entry was posted in Writing and tagged Scrivener on December 26, 2012 by shannon. Back when I wrote my first impressions of Scrivener, I have to admit, I wasn’t overjoyed with the program. I found a couple bugs, and the environment does have a learning curve. However, as a more thorough test, I wrote a 1700 word periodical article in Scrivener. When that went okay, I started a re-write of a work-in-progress. The Binder is center of Scrivener. It allows you to keep scenes and chapters separated into logical units, which can later be compiled into a single document. In addition to chapters and scenes, you can keep notes outside the manuscript. The Novel Format sets up folders for Characters, Places, Research, and whatever other custom folders you want to add. You can have this as a persistant left column to the program, or you can hide it by clicking on the picture of the binder above it. One of the biggest problems I have when writing a novel is remembering what I was doing 20 days ago. The names of minor characters or even the full names on major characters sometimes alludes me. I frantically try to search old files for the scene where–I think–I used their name. To alleviate this problem, I had started awkwardly taking some notes in an excel file, but that meant switching to a different document and I’d sometimes forget to do it. Scrivener makes this much easier. By letting me keep a folder of character information at the bottom of the binder. Also, when it’s right where I can see it, I actually remember to make a note of things. Another thing I have trouble doing is remembering what day it is. Scrivener helps with this too, but allowing me to take notes on every scene. That’s a rather personal question, don’t you think? No, the novel, how long is the novel? This might seem rather trivial, but I never really knew how long my novels used to be. I had an estimate based on the general length of my chapters and the number of chapters I’d completed, but if I wanted the real number, I had to open up each chapter, put the wordcount into excel and total them. It’s not all coming up roses. Not everything is coming up roses. For instance, I want to export chapters six and seven for editing or critique. I can “compile” these into a word document to distribute, but they will always come up as “Chapter One” and “Chapter Two.” Because they are the first two chapters in a compile. After getting over my initial bumps, my conversion to Scrivener has been a positive experience. If nothing else, I believe it is worth the $40 to find out if it fits your work flows. 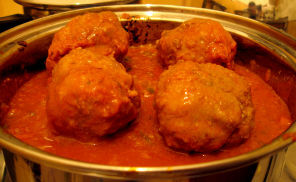 This entry was posted in Computers, Me, Writing and tagged Scrivener on February 8, 2012 by shannon. I am usually not one for using writing tools. I have learned to do really well in Microsoft Word. I have a system for revision and backup that I’m happy with, and I’ve seen some “revolutionary” writing tools really mess up other people’s manuscripts. However, I’ve heard really good things about Scrivener, and since an introductory price of $36 would not break the bank. I decided to give it a shot. Just for the record, this isn’t a full review, this is just a collection of thoughts I had after downloading the program. Windows installation went smoothly. I was able to activate the software on my laptop and desktop machine with no problem–Scrivener is licensed per user, not per machine. The first thing you see when opening Scrivener is the option to create a project from a template. I created a “tutorial” project, and was greeted by a Scrivener document telling me how to make Scrivener documents. I looked at this for five minutes before getting bored. I decided to start by importing a small project, an article I’m doing on Electronic Voice Phenomena I’m doing for ParABnormal magazine. Scrivener parsed my Word document perfectly. Then, I used Scrivener to break down the article into logical sections. 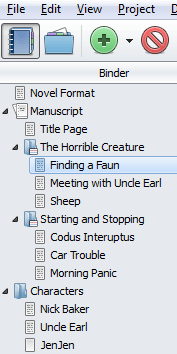 After that was done, I wanted to see how Scrivener put things back together again. First, I tried “Export” off the file menu. I don’t know what it does, because it consistently errors out on my three page composition. Next, I tried a custom compile. I was much happier with this feature. You can tell scrivener how to transition between your sections–everything from a like break to a page break with a new header, and includes several options for manuscript formatting, such a straitening quotation marks, and replacing the ellipses character with three periods. After a little finagling, I was able to re-compile the document to its original appearance. I decided to move on to research. The research section allows you to create a type of note called “website.” So, I excitedly typed in one of my sources, expecting A) the web page would cache locally with all the graphics and formatting, or B) a link that would launch the local web browser. I got C) a paged of text rendered from the homepage of the website, which was mostly legal disclaimer and credits, with no pictures or formatting. Then I created a generic text note, named it “websites”, and pasted in the site address. This pretty much covers my first hour with scrivener. I don’t know if I’ll keep at it or not, but after getting my feet wet, I think I’m ready to try some of the video tutorials on their site. Then, I actually have an article to finish. Maybe I’ll do a follow-up if I find anything interesting. This entry was posted in Computers, Me, Writing and tagged Scrivener on November 14, 2011 by shannon.